MAKS 2017 is the right place not only for aerospace OEMs but for MRO providers as well. Russia’s Engineering Holding clearly stands out for having recently started offering a variety of unique maintenance services on Western-built aircraft operated in Russia and the CIS. 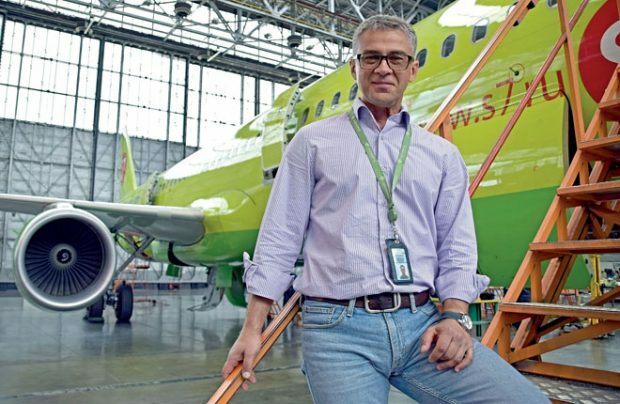 Alexander Filippov, director for business development at Engineering, told Russian Aviation Insider what the company has on offer with regard to Russia’s Irkut MC-21 narrowbody program. — Since last MAKS, Engineering Holding has launched several projects in conjunction with prominent international partners. These projects are quite significant to the local market, both in their scale and relevance. Could you tell us more about them? — Indeed, last year Engineering opened a CFM56-5/7 engine workshop at its Domodedovo airport facility with support from SR Technics. Until that moment, Russian operators of aircraft powered by these engines would ship their powerplants abroad for even minor repairs. Our workshop turned the tables. The same applies to vacuum toilets produced by Zodiac Aerospace. Now that we inaugurated a dedicated facility at Domodedovo jointly with Zodiac last fall, operators no longer need to have their lavatories repaired outside Russia. Finally, this spring our joint venture with Israel’s TAT Technologies became operational at Novosibirsk’s Tolmachevo airport. Our joint venture, TAT Engineering, specializes in heat exchanger repairs. This is the first facility of its kind in the region. I would like to emphasize that all these projects are beneficial to everyone involved: airlines now have an opportunity to repair their components at home; our foreign partners have become closer to their customers; and Engineering is their “port of entry” onto the Russian market. We also opened up new horizons, and so has Russia’s MRO industry as a whole. — It has really been an impressive amount of work. Will all these projects be expanded in the future? — They certainly will. Our joint venture with TAT Technologies has just become operational, so we have yet to see some tangible results there. As for the engine workshop, by the end of this year we will have doubled our repair capacities with support from SR Technics: we are opening a similar facility at our base in Mineralnye Vody. Speaking of our cooperation with Zodiac Aerospace, the true value of this project is not at all in the toilets. Zodiac Aerospace Group manufactures a broad range of systems and components for commercial airliners, including for the Airbus A320 and Boeing 737NG families, which are particularly popular in the region. We are currently gearing up to extend our cooperation to cover oxygen equipment and evacuation slides. — Zodiac Aerospace is a supplier for the Irkut MC-21 program. Is it possible that Engineering will provide maintenance services on the type? — We are of course eager to enter the aftersales market for the program. In the recent years we have had some successful experience cooperating with a number of manufacturers that will supply equipment for the MC-21. I am convinced that we would be able to implement this experience in the best way. It is a great platform for developing future competencies as applied to the next generation of components and systems for the MC-21. Irkut has expressed an interest in localizing the larger share of maintenance capabilities here in Russia. Wherever such localization is deemed commercially viable for the aircraft’s operational economy is an opportunity for us to step in, and we are ready for this. Naturally, we will aim to get involved as massively as possible. — Do you mean system and component maintenance? Or are you considering airframe checks as well? — It is both, actually. We believe that the MC-21 will only become a market success if comprehensive support solutions emerge in Russia. Irkut is working toward this goal. For instance, a tender has been announced for a comprehensive MRO provider that would offer all types of services: from airport line maintenance to heavy checks. We are running in that tender. We would like to hope for long-term cooperation with Irkut. I believe that Engineering’s massive experience with comprehensive MRO programs for modern aircraft types will be our great asset in terms of organizing aftersales support for the MC-21. It is a new product, but the recipe for its success is similar to those for the types which are already established on the market. I proceed from the premise that the aircraft’s performance has been defined correctly, with the target customer base in mind. Now it is vital for the aftersales support and continued airworthiness services to be organized professionally. — It would be interesting to see the outcome of this. Is it possible that Engineering will eventually become involved in production operations, not just in MRO services? Do you have such ambitions? — It is too early to say for sure, but we certainly do have the ambitions. I can only tell you at this point that we are working on a large-scale project, one that we view as a good chance for us to enter the modern high-tech production market. Strange as it may sound, if the project proves a success it will be a breakthrough in a sector outside aviation. I am talking about Penza-based Special Design Bureau for Turbochargers, which is involved in the transport engineering sector. Engineering Holding acquired the bureau in the spring of last year. We are currently conducting a round of consultations with GE Transportation, a global leader in equipment manufacturing. If our company joins the project, this will result in both significant investments in new equipment and a serious overhaul of the design bureau’s infrastructure and production facilities to make it compliant with GE Transportation’s requirements. The investment in development would be huge. This project is not just about the Russian market, even though one of the Penza bureau’s major clients is Russian Railways. The point of the GE Transportation project launched in Russia is to turn the country into a global production platform for railroad diesel engines that would sell all over the world. There is no prerequisite for the Russian partners to be immediately prepared to start manufacturing something. I guess it is safe to assume that facilities capable of this do not exist in Russia at all today. GE Transportation is searching for partners that could eventually become its suppliers, having renovated their equipment, obtained the requisite certificates, etc. It is normally a long process; sometimes it takes up to 18 months. In the final phase, the company that has been designated as a GE Transportation-approved supplier must demonstrate its technical capability to manufacture components to GE Transportation specifications, using approved equipment. So we are now investing in an assortment of new production equipment; the list has been approved by GE Transportation, as has been the list of components we will manufacture. We underwent the first GE Transportation audits last year, successfully passing two out of a total of four. Once we have completed this process, our company will become one of GE Transportation’s suppliers. We hope that this official status, and our success story of working with an industry giant of such a scale will eventually enable us to start manufacturing aviation components. The road that we are taking might seem long and costly. But it has one unbeatable advantage: it is well structured and has a clear financial prospect. Since the Penza bureau is a 100% subsidiary of Engineering, I am hopeful that in the near future I will have a chance to announce that Engineering has become an official GE Transportation supplier.